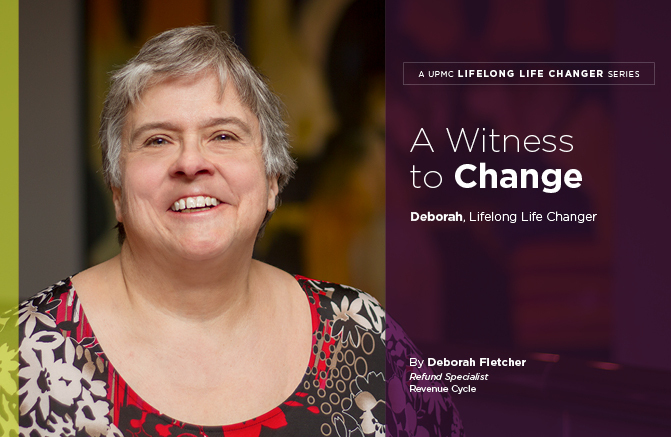 My name is Deborah Fletcher, and I’m a UPMC Lifelong Life Changer. I started working here at age 19 and am now 63 years old. I started in the forms processing department at Western Psychiatric Institute and Clinic of UPMC in 1974, and at that time we did not have any computers at all. It was all paper files and old address graph machines. When the computers came in, I had to learn to type on a ten key pad right handed — a hard task as I was left handed! I learned a lot at Western Psychiatric Institute and Clinic of UPMC and stayed there for 13 years. In 1987, I moved to Falk Clinic and learned some coding and data entry. I then moved to the registration area at Falk Clinic and met patients from everywhere, which was very rewarding. After a few years there, I moved to the patient billing area to learn about insurance. As the years went on, I learned so much. It is too much to describe! I have worked in customer service on the phones with patients and in the pre-arrival area verifying insurance, and now I am in the credit balance department. I have been in many areas and in different buildings throughout Pittsburgh. I worked for 28 years in Oakland and the rest of the time in the South Side at the Quantum Building. UPMC has treated me very well. I have met and worked with so many people who have become lifelong friends. Some of them have retired, and I will retire from UPMC, too, having worked here my whole career. It has been a great journey!